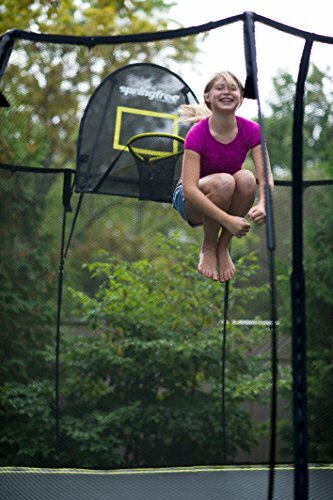 Springfree trampolines are innovative trampolines designed without the use of traditional springs. Intended to be safer, they rely on a series of rods that provide lateral movement, and limit the user’s potential impact with a metal frame. They’re available in a variety of sizes. Each comes with tgoma®, a smart digital game system that uses Bluetooth® to connect sensors in the trampoline mat to your tablet, allowing jumpers to play interactive and educational games, utilize fitness apps, count jumps and track calories burned. All models are weather resistant and made with a galvanized and powder-coated steel frame, a UV-stabilized polypropylene mat, a high-strength polypropylene, no-climb FlexiNet™ safety net, and composite rods that are covered by plastic sheaths to protect them from UV light. All five models have a jumper weight maximum of 220 pounds, and a structural load capacity of 1100 pounds. Springfree Trampolines started their quest to build a safer trampoline in 1993 and they’ve been perfecting their design ever since. The parts used to build a Springfree trampoline come from all over the world, including Canada, New Zealand, and the Netherlands. The factory is located in China. Owners are very excited to report that Springfree trampolines are safer than traditional trampolines. Each trampoline comes with a safety net that’s reported to be strong and well made. Also, the trampoline’s design prevents you from hitting the metal frame, or getting your fingers and toes stuck in traditional trampoline springs. The vast majority of reviewers report that this trampoline feels solid, is made from quality materials, and well built. Many say that it feels sturdier than other trampolines they have owned. Many owners report they are pleased with how this trampoline has held up over several years of near daily use. 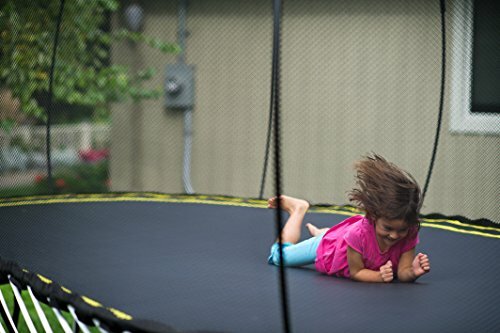 A tiny percentage of reviewers say that certain parts didn’t last as long as they expected, especially given the higher price of the trampoline. Many owners report that assembly can be difficult and time consuming. Others state assembly went smoothly. Some said they paid for assembly service, and they recommend it if it’s available in your area. The majority suggested watching the manufacturer’s video demonstrating the assembly instructions, and to go slowly and take your time. In addition, owners strongly recommend having at least two adults, if not more, working together to assemble the trampoline. They report that is takes three to four hours to fully assemble. Owners report that Springfree Trampoline’s customer service department is easy to reach for any questions or concerns. You can purchase a Springfree trampoline from the manufacturer’s website, by visiting one of their stores, from Amazon, or other online retailers. The shipment of your trampoline includes the trampoline frame, rods, safety net, and jumping mat, as well as the tgoma® digital game system. Depending on where you purchase the trampoline, your package may include other accessories, such as a FlexrHoop basketball hoop and FlexrStep ladder. Springfree trampolines range in price from roughly $2000 to $3000, depending on the retailer and included accessories. This price range does not reflect possible shipping costs, additional accessories, or assembly services. Springfree Trampoline offers a full range of replacement parts. In order to learn the details, call Customer Service at 1-877-586-7723. The manufacturer recommends frequently inspecting your trampoline to look for damage, and keeping it clear of any debris including pine needles, leaves, and snow. If necessary, use a mild dishwashing liquid for any cleaning and avoid the use of harsh chemicals. Springfree trampolines are recommended due to their clever construction and high quality. They are designed to be safer than traditional trampolines with springs. Also, Springfree trampolines boast cutting edge technology, with the included tgoma® digital game system. Many owners feel that this has increased their kids’ motivation for active, outdoor play.